Lexus sure loves itself some coupe. Its full family of RCs with rear or all-wheel drive and 4-, 6-, or 8-cylinder engines would seem to be more than enough for any manufacturer these days, what with the perceived extinction of the car from the onslaught of that invasive species known as the crossover SUV. Well, make room for the LC 500 in a choice of V8 gas-engine or V6 hybrid models. The expressively styled and handsomely appointed luxury coupe joins the market for the 2018 model year. The LC 500’s flush-mounted door handles power outward so they can be grasped to unlatch the doors. Pressing the the door handle flush locks the car. Just visible in this photo are the carbon-fiber roof panel and cutline for the trunk-mounted active rear spoiler–both of which are included in the $5960 Performance Package. 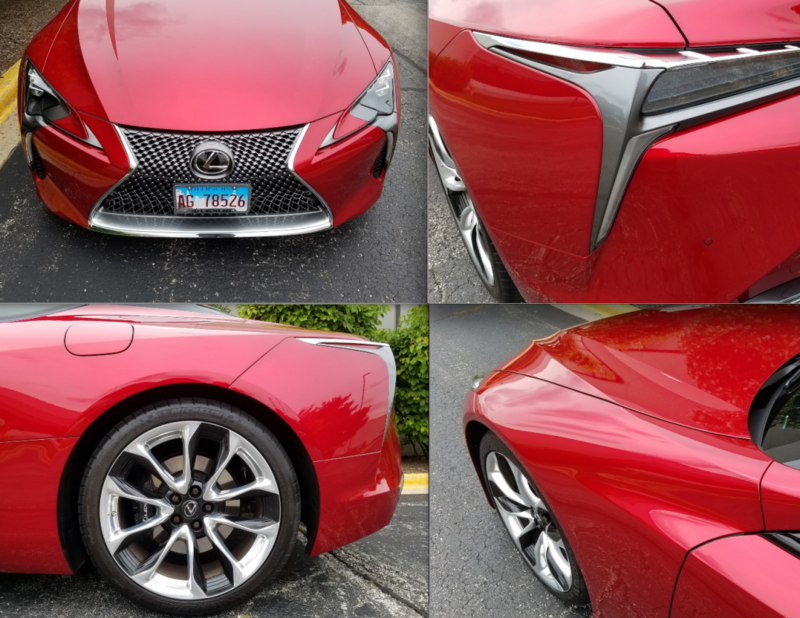 While the RC is a bit of a looker and, as an RC F quite a goer, it is considerably different from the LC 500. The latter is larger (its 113-inch wheelbase is 5.5 inches longer than the RC’s span) and heavier. 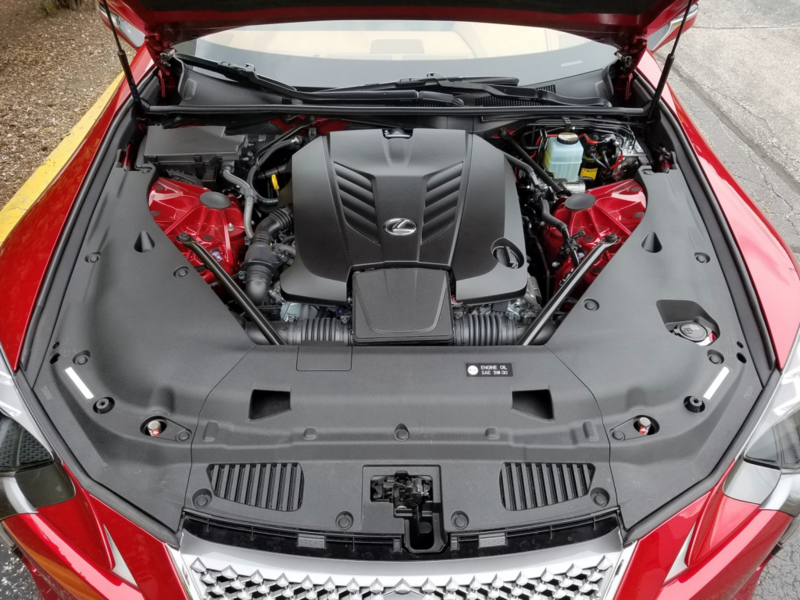 The V8 LC 500 that Consumer Guide® tested has a listed base curb weight of 4280 pounds, 322 more than an RC F. Interior designs are distinct—the LC’s is very high-style—and there are some equipment differences. Then you get to the window sticker, and the gap between the cars becomes a canyon. The V8 LC 500 starts at $92,000, a jump of $27,825 over an RC F, which tops the RC product line. 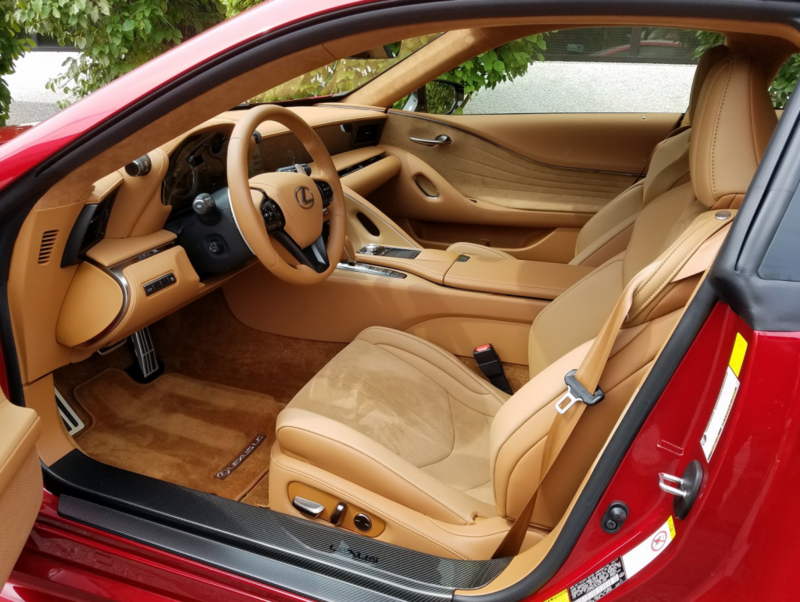 The LC 500’s decadent cabin is sumptuously trimmed in rich leather. Carbon-fiber door sills, Alcantara suede seat inserts, and a full Alcantara headliner are also part of the optional Performance Package. Both the LC 500 and RC F use Lexus’ 5.0-liter naturally aspirated V8. In the LC it is rated at 471 horsepower and 398 lb-ft of torque—slight gains over the respective 467 and 389 figures in the RC. Thus, considering its greater weight, the LC 500 has the same 4.4-second 0-60-mph time as the RC F, according to the manufacturer. The LC 500 does come with a great 10-speed automatic transmission with two more gears than in the RC F’s autobox. Plus, the new car has standard drive-mode selection (activated by a drumlike control that sticks out of the instrument cluster) with a pair of “Sport” settings that turn up the performance heat. A muscular exhaust note lets the driver know when the LC 500 is feeling its oats. A large, centrally located tachometer surrounds a digital speedometer readout in the LC 500’s gauge cluster. The rear-seat area is best used for small-items storage; legroom disappears completely if the front seats are set all the way back. EPA fuel-economy ratings for the LC 500 are 16 mpg in city driving, 26 mpg on the highway, and 19 mpg combined. From that it might have been reasonable for this driver to see something in the vicinity of 20 mpg from his 188.3-mile stint composed of 40 percent city-type driving. However, he averaged 18.52 mpg. Both of Lexus’ performance coupes have fully independent suspensions, but the LC’s specific platform uses double-joint multi-link control arms and different shock absorbers. It also has meatier 4-wheel disc brakes and larger-diameter staggered-width alloy wheels. (Twenty-inch wheels are standard on the LC 500 but the test car had extra-cost 21s.) Run-flat performance tires are mounted on the rims. The test car tracked really well and displayed excellent control of cornering lean. An optional speed-activated spoiler offers added downforce in more aggressive driving. Steering was highly responsive—and got a boost from the active rear-steering feature included in the $5960 Performance Package option. The ride is always firm but the drive-mode “Comfort” setting takes off some of the edge. 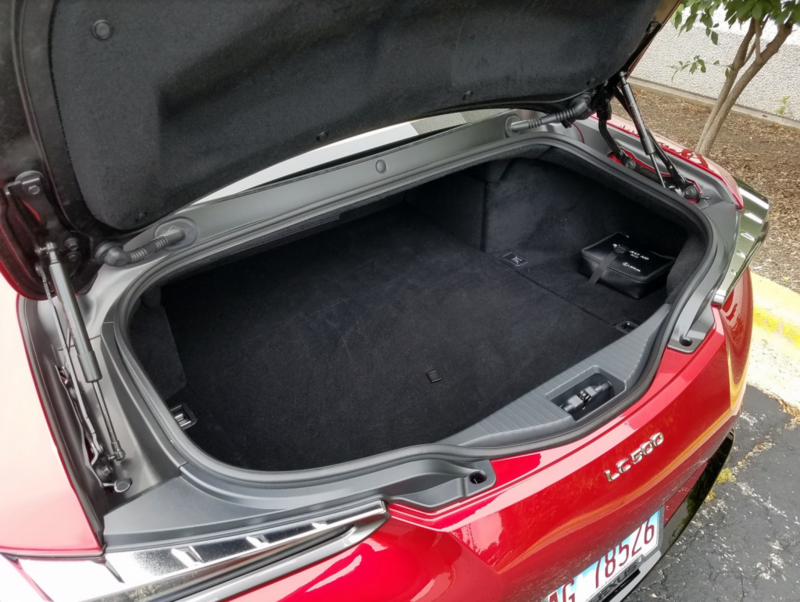 Not surprisingly, trunk space is not an LC 500 strong point. The trunk is especially shallow, and liftover is high. The LC 500 is as much about luxury as it is about performance. Padded soft-surface materials extend all the way down the doors and around the sides of the rear section—where no one may ever sit. (Tellingly, there are no personal-storage accommodations in the rear.) The console, too, is plushly outfitted. Leather seats are standard—another difference from the RC F—but the test car included 8-way-adjustable sport seats with Alcantara inserts and an Alcantara headliner, another Performance Package item. Standard items include things like keyless entry and starting, heated and ventilated front seats (with 10-way adjustment), leather-covered power tilt/telescoping steering wheel with magnesium paddle shifters, heated memory mirrors, an audio system with HD radio and satellite radio, navigation, Bluetooth connectivity, and Lexus Enform app suite. Safety technologies include forward-collision and pedestrian detection, radar cruise control, automatic high-beam headlamps, lane-departure warning, and lane-keeping assist—though, curiously, rear cross-traffic alert and blind-spot monitor cost extra. The virtual gauges, a feature picked up from the erstwhile Lexus LFA super coupe, are configurable (the dominant speedometer switches to a tachometer in Sport modes) and include a g-force meter. Audio, navigation, and other systems are monitored on a 10.3-inch screen set deeply into the dramatically styled dash. Managing them requires console-mounted remote controls with a pad for pinch, swipe, or “written” actuation—but it can be too sensitive for use in a moving vehicle, and takes some driver attention from the road ahead. Controls for the standard automatic dual-zone climate system are separate with switches for all functions, including fan speed and temperature that require repetitive presses. Front seats are comfortable but headroom is limited—and downright chopped in back, where this 5’-10.5” driver had to duck to one side. Nobody could have sat in the seat behind me. A front passenger with the seat adjusted a little further forward might have created enough space for a rear passenger, but with little leg and kneeroom. Over-the-shoulder vision under the drastically sloped roof is not great. The LC 500’s naturally aspirated, 471-horsepower 5.0-liter V8 delivers blistering acceleration, and has a surprisingly raucous exhaust note for a luxury car. Personal storage isn’t especially generous. Two covered cup holders are scattered around the console. The glove box and door pockets are small. The best room is in the console box, but that’s not especially huge—and it has digital-device inputs inside. The trunk will carry a week’s groceries for two, or their weekend luggage. Liftover is high due to the hatchlike lid. If a Lexus with fairly muscular performance is your goal, the RC F will deliver about as well as the LC 500 at a considerable savings. Plus, the LC can really pack on the dollars. GG’s test car hit $105,060 with delivery and options. Sophistication has its cost, too. The Lexus LC 500 is quite the sensual experience. I often felt compelled to take a quick walk-around of the car before getting in, just so I could soak in the rakish, voluptuous styling and all those delicious details: the luminous, nearly candy-apple “Infrared” paint job; the carbon-fiber roof insert flanked by blade-like chrome trim pieces; the sinewy, muscular shape of the front fenders; the neatly sculpted bodyside scoops; the dazzling reflective taillights. 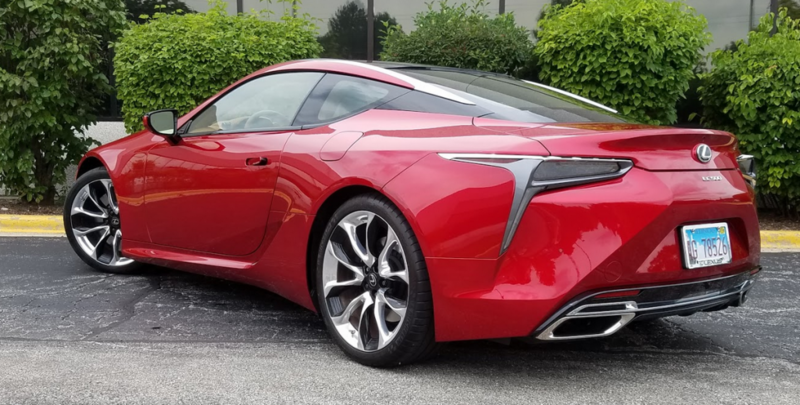 When I first saw photos of the LC 500, it didn’t strike me as much of a departure from its smaller RC sibling—but pictures don’t always tell the full story. In person, the LC is breathtaking—truly exotic… and truly traffic stopping. I had more people oohing and ahhing over our test car than I’ve had in years of driving test vehicles. After spending a few moments admiring the LC’s exterior, it’s time to grab hold of the slick pop-out door handle and slide inside. Wow… what a cockpit. The sumptuous upholstery is the color of light English toffee, or maybe butterscotch. The carpet is extra-plush. All-around fit and finish is top notch. The full faux-suede headliner gives an especially sybaritic vibe, and it’s accented by matching inserts on the zen-garden-like door panels and cossetting, low-slung seats. The LC is big car, especially for a grand touring coupe, but this is a cozy cabin for an extra-tall guy like me… my head is very close to brushing that fancy suede headliner. Let’s take a minute or two to get comfortable, sink down into the seat a bit, smell the leather upholstery, and run a hand over the switchgear and the leather-wrapped steering wheel. The LC 500’s sleek, muscular bodywork looks especially dazzling up close. Forged 21-inch wheels are a $2650 option. Now, let’s start it up. Give the satin-finish start/stop button a push, and the 471-horsepower 5.0 V8 barks to life like it’s clearing its throat, then settles down into an ominous, gravelly burble. The LC’s exterior styling and cabin trimmings are posh and sophisticated, but this hairy-chested exhaust note wouldn’t sound out of place if it was coming from a hot-rodded 1970 Chevelle SS454. All part of the debauchery, I guess. For a car like this though, I’ll get over it. The LC 500 delivers performance and panache in spades. Its curb appeal and coddling capabilities are well beyond the more affordable Lexus RC F. And, though it’s as sophisticated and buttoned down as any high-end Lexus, there’s a raw edge to the LC’s personality that makes it much more interesting behind the wheel. 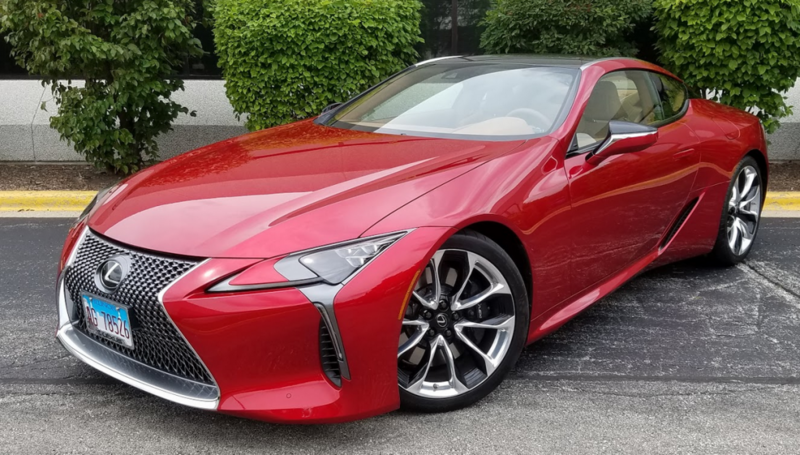 Pricing for the LC 500 quickly reaches into six-figure territory, but this luxurious Lexus delivers head-turning style, vigorous performance, and a lavishly finished interior–all of which make it competitive among similarly pricey rivals. Written by: The Daily Drive staff on September 19, 2017.